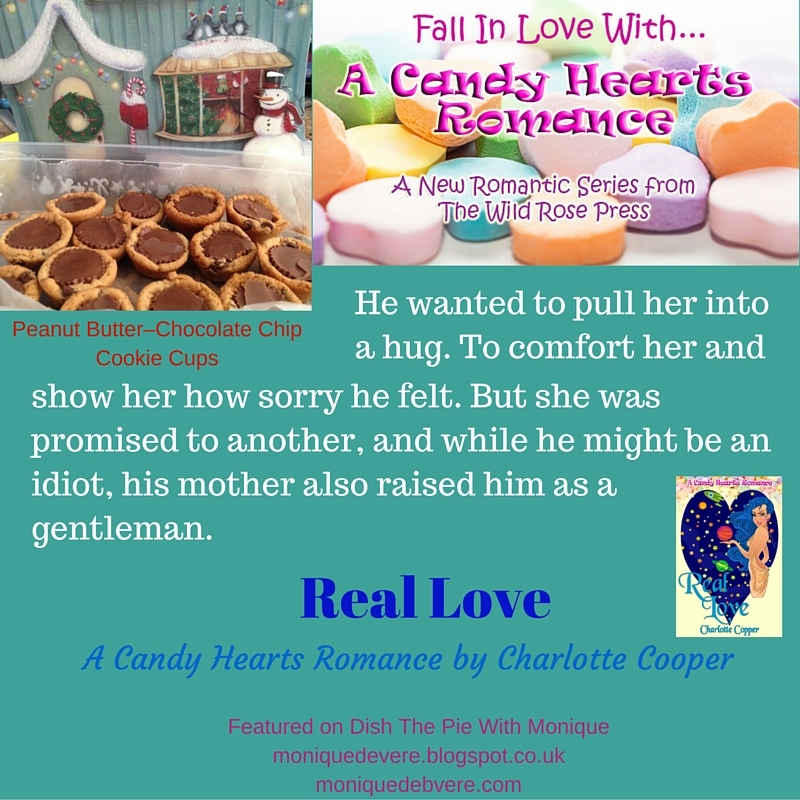 Please help me welcome fellow Candy Hearts Romance author Charlotte Cooper to Dish The Pie. 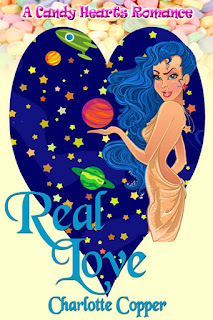 Today we'll be talking Peanut Butter–Chocolate Chip Cookie Cups and Real Love, her new Candy Hearts release. Charlotte: Without a second thought…YES! These Peanut Butter-Chocolate Chip cups aren’t necessarily my favourite, but they are quick and simple and delicious. Monique: Quick—simple—delicious...my kinda pie! Tell us more. Charlotte: I hate to cook! In fact, until this Christmas I survived three years without an oven…so needless to say, baking isn’t a high priority. Having said that, I love these quick and easy “cookies” and make them regularly for barbeques and get togethers. Cut cookie dough into thirds, and then cut each 3rd into three again. You now have nine sections….divide each into quarters. Total 36 pieces. Bake for time on package. Let cool for a minute or two, and then press the peanut butter cup into the middle of each cookie. Don’t cool too long or the cookie will harden and you won’t get the pb cup inserted. Let cool completely before trying to remove from pan. Charlotte: I love a good steak, only to be seconded by a good burger. Where’s the beef? Monique: I have to admit to not being a big fan of red meat. When was the last time you cried? 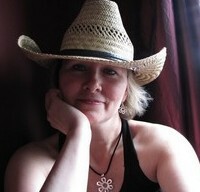 Charlotte: I’m a 14 year breast cancer survivor and I received a positive biopsy result just before Christmas. Needless to say, Christmas 2015 had its ups and downs. Monique: I’m so sorry to hear that, Charlotte. I pray all goes well and you make a complete and swift recovery. Sending you lots of love and hugs. Which season (Spring, Summer, Autumn, Winter) is your favourite and why? Charlotte: Summer. If I had my choice, I’d live in shorts and flip flops all year round…not something that is done in Southern Ontario. I hate winter and snow, and we didn’t have any snow here until 12/29 and I was sooo loving it! Monique: I’m a total summer girl too, and if there’s a beach in sight, I’m in heaven. Are you married? How did you meet your husband? How did he propose? How long have you been together? Charlotte: My husband and I met the first week of university and dated for all 4 years. We got engaged but broke up before the wedding. We each went on to marry someone else, but then after those relationships failed, we ended up together again. He proposed while we were cleaning for a Christmas party. He then took the ring back so we could hide it from the party guests. When he then announced our engagement at the party, he pulled out a ring that was twice the size of the one from earlier that day. Monique: Oh, Charlotte, how utterly romantic! 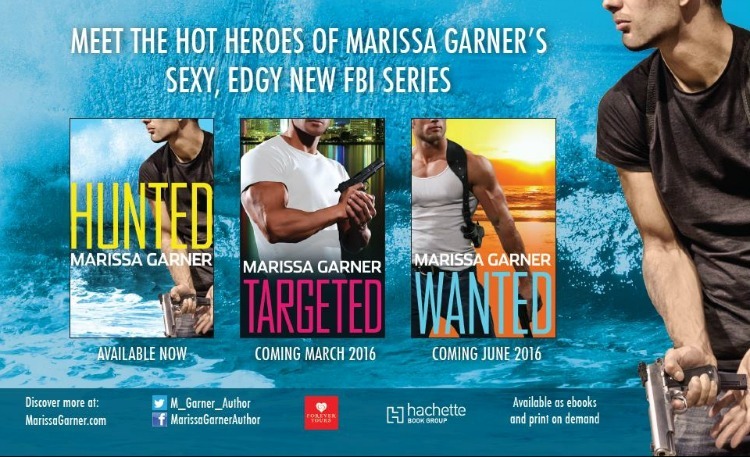 I love reunion/second chance romances, and yours sounds like it ought to be told. Speaking of which, would you tell us a bit about your new release? Charlotte Copper lives in Stouffville, Ontario - that's in Canada, eh. When she isn't working at her full-time job, Charlotte likes to craft, read, go to movies, and, of course, write. Charlotte hopes to have all of her stories published some day because, as a romance writer, she believes in happy endings! 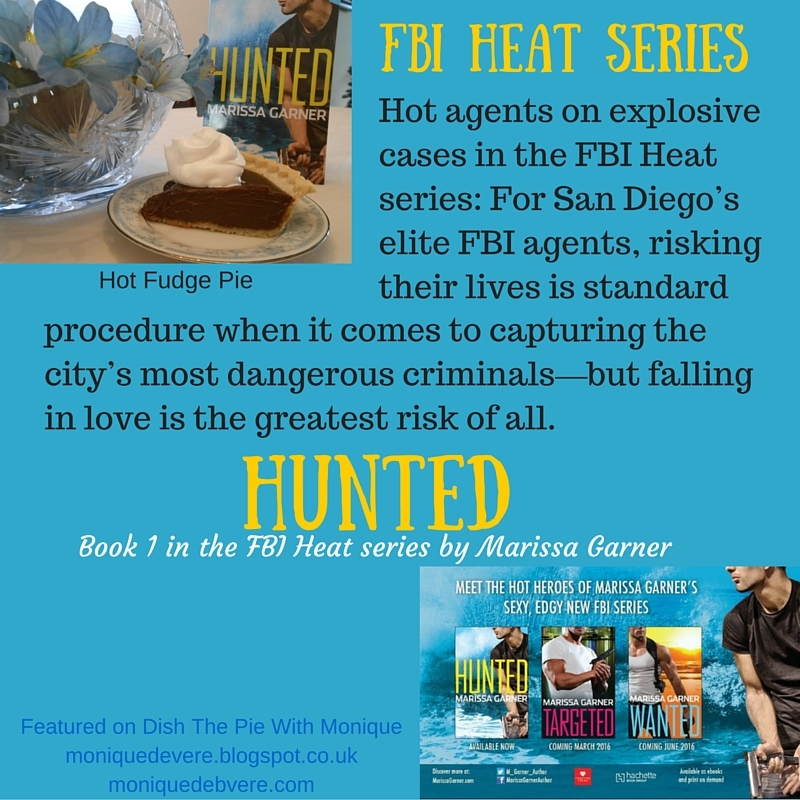 Marissa: Love, love, looove desserts. Just about anything chocolate gets a high ranking, but this Hot Fudge Pie is definitely #1. I hope you enjoy it. Monique: You had me at fudge, hunny! Let's not keep the readers waiting. In a heavy, medium-sized saucepan, whisk sweetened condensed milk, water, and egg yolks together until thoroughly blended. Then heat over medium heat, stirring continuously. When hot, add chocolate chips, vanilla, and salt. Continue to cook until mixture thickens and turns glossy. Pour into already baked piecrust. Top with meringue and brown lightly OR let cool and top with whipped cream before serving. Enjoy! Monique: Oh, we will! Have you ever eaten pie for breakfast, Marissa? If so, what was it? Marissa: That’s rather personal, don’t you think? Any question starting with “Have you ever…” can raise some rather serious issues. But since pie for breakfast isn’t too serious, I’ll dish just for you, Monique. The day after July 4th, the pie is apple. After Thanksgiving, pumpkin pie is yummy in the morning. And the day after I made the Hot Fudge Pie for this picture, guess what I enjoyed for breakfast. Monique: Haha... "Have you ever" can also be the beginning of a really cool game. I see you have a strategy...a pie for every occasion...I like it! Are you married? How did you meet your husband? Marissa: Yes, I’m very happily married. We met at college, taking a class in one of those theatre-style classrooms. He says he noticed my legs first. Hmmm. Monique: Aww...yeah, it's never our brain, is it?? What do you love most about him? Marissa: He’s my rock and the wind beneath my wings. Yes, I believe a person can be both. Monique: You lucky girl! What is your idea of an ideal vacation? Marissa: I love going to new places and doing new things. It can be as simple as visiting a national park or as extravagant as a Mediterranean cruise. My husband shares this philosophy, so we’ve taken many diverse trips. We’ve travelled from Athens to Anchorage to Acapulco. Not all in one vacation, mind you. I’ve enjoyed the thrill of hiking on a live volcano and a receding glacier. Recently, we explored Yellowstone National Park for the first time, and it was amazing. Monique: Wow! I'm kinda tethered to the home front at the moment, but I love to armchair travel. Bet you have some amazing memories! Share one fact about yourself that might be surprising. Marissa: I learned to belly dance. My husband enjoyed it more than I did. Thank you so much for dishing the pie with me today, Marissa. Please tell us a bit about your new series. We're back with another Dish The Pie guest. Please help me welcome Historical author Elizabeth Bailey. She's here today to dish the pie on Silence of a Stranger, her Romantic Suspense novella, and to share a recipe with us. Yummy Sticky Marmalade and Banana Bake is Elizabeth's very own creation. Elizabeth: I love desserts but I’m horribly deprived these days as I’m off sugar. 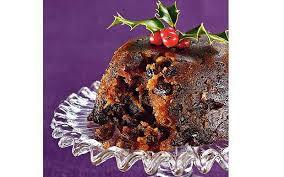 But I did treat myself to my favourite Christmas Pudding on Christmas Day. No recipe for that as I buy the most nutty one I can find and shove it in the microwave! Once hot it is covered in boiling brandy and set alight. Then grab your serving, cover in brandy butter and cream and stuff your face. But I will share a very easy unnamed recipe of my invention which has a similar effect of yummy stickiness. Monique: Can’t wait! Here's the recipe, guys. Bash up the biscuits into chunky crumbs and lay them in bottom of oven dish. Splash in as much alcohol as you like, spreading it about. Add a layer of thickly sliced banana. Spoon marmalade over the top. Bake in the oven for about 15-20 mins. Serve hot, with or without cream. Elizabeth: I have eaten a pork pie in the morning, a mini one, but can’t remember if that was breakfast or not. I love pork pies, a traditional British pie so I don’t know if you have them in the States, and I like them hot so pop them in the microwave. Never buy cheap pork pies! Just not the same. Always worth spending an extra few pence to get the better flavour. Monique: Pork pie wasn’t the sort of pie I had in mind, but since you’re off sugar I’ll let you get away with it. What sort of things do you find funny, Elizabeth? Elizabeth: I’m a sucker for wacky humour that is also clever like Monty Python, and I love witty stuff like Noel Coward. Friends is right up my funny bone. The gags that get me on Facebook are those which take something well known and give it a silly twist. The antics of cats are funny, and dogs just have to trot along the road to make me laugh. I laugh a lot. Life is often funny. Monique: You're a girl after my heart, Elizabeth. I love to laugh and do a lot of it, although I have to admit that even after living in the UK for over 30 years, I still don’t get British humour... When was the last time you cried? Elizabeth: When I was writing a scene in my current novel the other day. And don’t get me started on sad moments in movies! I once started crying at the last half hour of The Champ and I hadn’t even seen the film. Funnily enough, I don’t cry about life much if it’s my story. Far more likely to cry in sympathy with others. Monique: I adore authors who can make me laugh and cry. Those are the books I treasure. Which season (Spring, Summer, Autumn, Winter) is your favourite, Elizabeth, and why? Elizabeth: I love Autumn (or Fall) because of the colours. I wait for the leaves to turn gold and red and am always disappointed if the winds blow them away before I get a chance to admire them. Also it’s never that cold in our Autumn in the UK, so the horrible weather hasn’t set in yet. Of course it rains, but then it always does over here! Monique: My mum loves Autumn also. I’m not a fan. I do hope we have more of a Summer this year. I’m so over the stormy weather. Describe your view of bliss? Elizabeth: A slow hot bath with lots of bubbles, followed by a comfortable bed and a really good book. I’m not that hard to please really. I usually do the bed and book on a daily basis, but the hot bath tends to be in the mornings and it isn’t nearly as blissful that way round. Oh, and add hot chocolate and I’d be in heaven. Thank you so much for dishing the Pie with me, Elizabeth. Would you please tell us a bit about your book? Bea crossed over to the desk and glanced furtively at the papers. They looked like letters. One with a signature lay on top: Rad. ‘Haven’t you taken off those wet things yet?’ said his voice from the doorway. He threw her a large towel and she caught it, hardly aware that she did so as she heard his next curt command. His manner unsettled Bea. In the kitchen, he had seemed to champion her against the others to some degree. 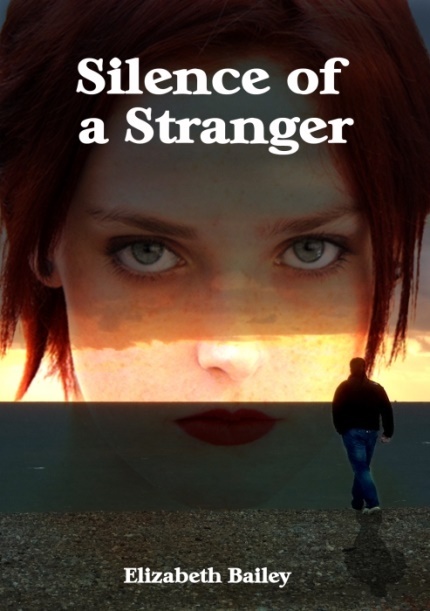 Alone with her, he had grown harsh, as grim a captor as Lyle was proving to be. As she stood there, uncertain, she saw him begin to undress himself, ripping off his jumper to expose the bare tanned flesh of his chest. ‘Get on with it,’ he snapped, without looking round, and she quickly turned away as he began to peel off his jeans. With caution, Bea took off her jacket and slid the damp sneakers off her feet. She sat on the bed to remove her socks. Rad wrapped a towel about his waist and slipped his underwear down beneath it. His eyebrow lifted as she stared. It took a full minute for the significance of this to penetrate. Appalled, Bea gazed at him. A cold monosyllable, as he dug into the chest of drawers. He glanced at her over his shoulder. Bea trembled, half in anger, half in fear. What had she got herself into? Defiant, she glared at him. He threw a sweatshirt onto the bed and paused. I grew up in Africa on a diet of unconventional parents, theatre and Georgette Heyer. Eventually I went into acting and trod the boards in England until the writing bug got me, when I changed to teaching and directing while penning historical romances and edgy women’s fiction. My 8 year apprenticeship ended with publication by Mills & Boon, and 18 historicals. Latterly I had two historical mysteries published by Berkley and I’m hoping to release more Lady Fan novels. 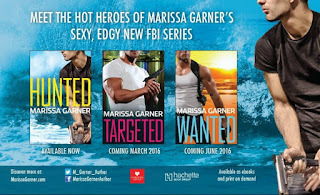 Meanwhile, it’s wonderful to be able to return to my first love and put out new and old releases in ebook. 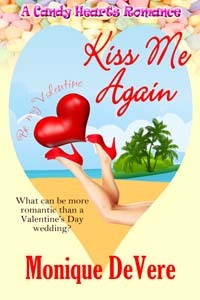 Happy Release Day for KISS ME AGAIN, part of The Wild Rose Press Candy Hearts Romance series on release throughout January and February 2016. As well as getting to enjoy over forty Valentine's Day novellas from this series, you also have the opportunity to enter the Rafflecopter draw for a chance to win a FREE KINDLE, courtesy of The Wild Rose Press. “Sam…” This time it came out breathy and needy. No matter how hard she tried, Riley just couldn’t fight the attraction that had been tormenting her for longer than she cared to admit. She fancied Sam from the moment she first met him that morning almost three months ago as they both set off to work. She raised her chin, met his gaze knowing he’d see desire in hers. The air between them pulsated. This time she made no attempt to hide her need. “You’re incredibly distracting, do you know that?” Sam’s finger grazed her cheek, followed the curve and warmed her skin. Keywords: Neighbors-to-lovers, romantic comedy, office romance, Island romance, Valentine's Day. **Don't forget to leave a comment to enter the Rafflecopter below for a chance to win a KINDLE FIRE, courtesy of the Wild Rose press**. Thanks for visiting! 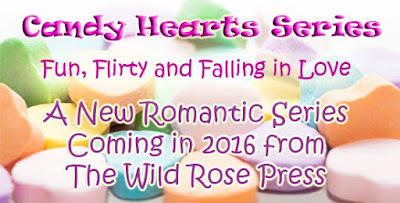 If you would like to view and purchase more novellas in the Candy Hearts Romance Series, please click the "Candy Hearts Series" page tab at the top of this blog, or click HERE. Nicole: I love desserts, probably a bit too much for my own good. 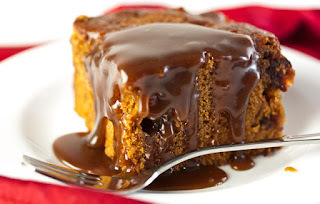 My absolute favourite is Sticky Toffee Pudding. It sings of winter evenings by the fire, real comfort food. Perfect for this time of year, although I could eat it at any time of year to be honest! My recipe is so simple to make I can promise you that once you’ve made it you will want to make it again! Monique: Ohhh...I just love this pudding all warm and sticky. Let’s have the recipe, then! 1. To make the pudding put the sultanas, dates and bicarbonate of soda into a heatproof bowl. Cover with boiling water and leave to soak. 2. Preheat oven to 180°C/350°F/Gas Mark 4. Grease a round cake tine, 20cm/8 inches in diameter. 3. Put the butter in a separate bowl, add the sugar and mix well. Beat in the eggs, then fold in the flour. Drain the soaked fruit, add to the bowl and mix. Spoon the mixture evenly into the prepared cake tin. 4. Transfer to the preheated oven and bake for approx. 35-40 minutes. The pudding is cooked when a skewer inserted into the centre comes out clean. make the sauce. Melt the butter in a pan over a medium heat. Stir in the cream & sugar, bring to the boil stirring constantly. Reduce the heat and simmer for 5 mins. 6. Turn out the pudding onto a serving plate & pour over the sauce. Decorate with the orange zest and whipped cream if desired. Remember the recipe is for 4, although you will definitely be tempted to eat more than 1 portion!!!! Enjoy. Monique: Have you ever eaten pie for breakfast, Nicole? If so, what was it? Nicole: I must admit I have not. I shall make 2016 the year that I do. I’m thinking apple crumble as that’s vaguely breakfastie! Oh am I missing the point? OK well then it would have to be flapjacks, something with a bit of a bite! Monique: LOL. That’s cheating! How important is humour to you? Nicole: Humour is really important to me. Humour has stood me in good stead over the years and even in the darkest of days it helps to shine a bright light. Throughout my career whether in PR or nursing, humour has been there helping to smooth out the bumps. I try to get a bit of humour into most things I write. It’s part of who I am so I try to make it a part of my characters too. Monique: I do love a book with humour. How often do you laugh? Nicole: I laugh every day. Whether it’s the dog being cheeky (and believe me she is very cheeky) or laughing because I’m embarrassing the kids. I try to embarrass the kids at least once a day! They are teenagers now and think that mums can’t be cool, after all, we’re mums! How wrong they are right?? Monique: Absolutely! There’s nothing like the joy of embarrassing one’s kiddies. What’s your philosophy in life? Nicole: My philosophy in life is to live each day to the max and see where it takes you. As clichéd as that may sound, it is something I wholeheartedly believe in. Each day truly is a gift and cannot be replicated. A few things have happened over the years which make me realise that life is precious and nothing can or should be taken for granted. We are all guilty of complaining about this or that but the reality is we have so much to be thankful for. I try to start each day thinking positively about the day ahead, it doesn’t always work but I try. Monique: Stellar philosophy. Start each day with thanksgiving. I like it. What is the weirdest thing you’ve ever done? Nicole: I’m not sure this qualifies as weird or exciting or both but I did once travel in a helicopter over the black forest in Germany with Bon Jovi, now that’s a whole different interview! Monique: Oh, I would love to hear the details of that story. Thank you so much for joining me on Dish The Pie, Nicole. Would you tell us a bit about your book, please? Set in the music industry of 1980's London, All Tomorrows Parties is a journey through life and love. Laine Marshall isn’t a product of the 1980’s she is the epitome of it. 18 years of age and working for one of the hippest labels around Vestal records. She takes the day to day hedonism of working for Vestal in her stride and experiences every emotion under the sun except the one she craves the most - love. Set against a backdrop of pop culture All Tomorrows Parties details what it’s like for a young girl entering the workplace for the first time. Into a world that for all its forward thinking is still struggling with the changing role of women and flavours of this are peppered throughout the book. “Let’s find a café somewhere, grab some lunch and plan our day, agreed?” said Andy as they finally stood on the quayside. They made their way to Café Pietro just off St Mark’s Square. After a quick lunch and glass of wine, they all decided to go their separate ways and explore elements of the city that appealed. They agreed to meet back at the quayside to catch the vaporetti at 6pm. Andy, Pete, Mary and Ella went straight to St Mark’s Basilica whilst John whispered to Laine he had a surprise to show her and they headed off towards the waterfront. “You’re being quite secretive John, what’s this about?” asked Laine. “Ah you’ll see”, he said, grabbing her hand and moving towards a small ferry. The boat took them to the small island of San Lozarro deli Armeni. The island was home to the order of Mekhitarist Monks, originally from Armenia. John explained that the island had been a place of love for the poet Byron. He knew from their conversations that Byron held a special place in Laine’s life. It was also fortuitous that San Lozarro deli Armeni was also home to some of the world’s rarest roses – a favourite for them both. Walking along the beach that first night, they had both been surprised by the other’s love of roses. It had sparked a debate on the origins of the rose and a discussion around why both the UK and the US had adopted it as their national flower. It had been the first of many coincidences. As they approached the island they were struck by its beauty. The monastery tower framed picture perfect against the powder blue sky, the jade blue sea contrasting against the backdrop of the soft coral stonework of the island. The island itself seemed to be perfectly square with the monastery centrally placed. Laine had heard of the island when she had read about Byron’s life and his love of Armenian culture but had never expected she would be able to visit it. “This is amazing John - how did you know about this place?” she said, taking hold of his hand. “One of the guys at the base mentioned it a while back, it’s not that well-known, but really worth the trip. When you mentioned you loved Byron, well, it all kinda fitted together”, he said, squeezing her hand just a little. They walked hand in hand through the cloisters of San Lorrazo del Armeni. The air was heavy with hints of musk and tea rose. Their olfactory senses at first overwhelmed as the subtle changes in scent presented itself, ebbing and flowing like the tide. The roses in the gardens were nurtured like much loved children, now resplendent in a wild spectrum of colours. A monk knelt, a trug by his side. His secateurs delicately dead heading the myriad of rose bushes. He turned and nodded as they passed. These roses had seen lovers come and go. The memory of their scent imprinted, able to trigger emotions of either love or sorrow. Petals fell as the breeze drifted through and scattered them onto the cobbled path. A carpet of resplendent blooms in multiple colours lay ahead of them. They walked slowly along the path; petals appeared to drop from the sky as if heralding their arrival. Instinctively, Laine took off her sandals. A mix of smooth velvety gloss and heat from the cobbles tickled the soles of her feet. John smiled. The more time he spent with Laine the more he realised how similar they were –both cherished simple beauty where they found it. 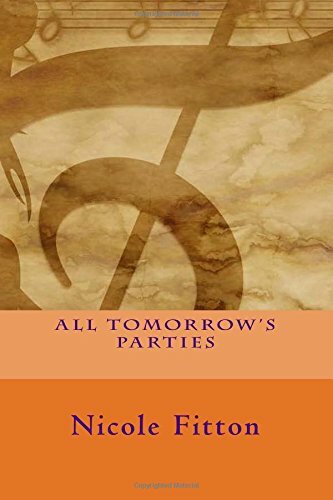 You can grab your copy of All Tomorrow's Parties from Amazon. Nicole Fitton is a freelance writer who lives in Devon with her children, husband,10 old hens, 1 very old rabbit, an even older cat and a very young springy springer. Her first novel – All Tomorrow’s Parties released in July 2015 is a contemporary romance set in the heady world of the 1980’s music industry. 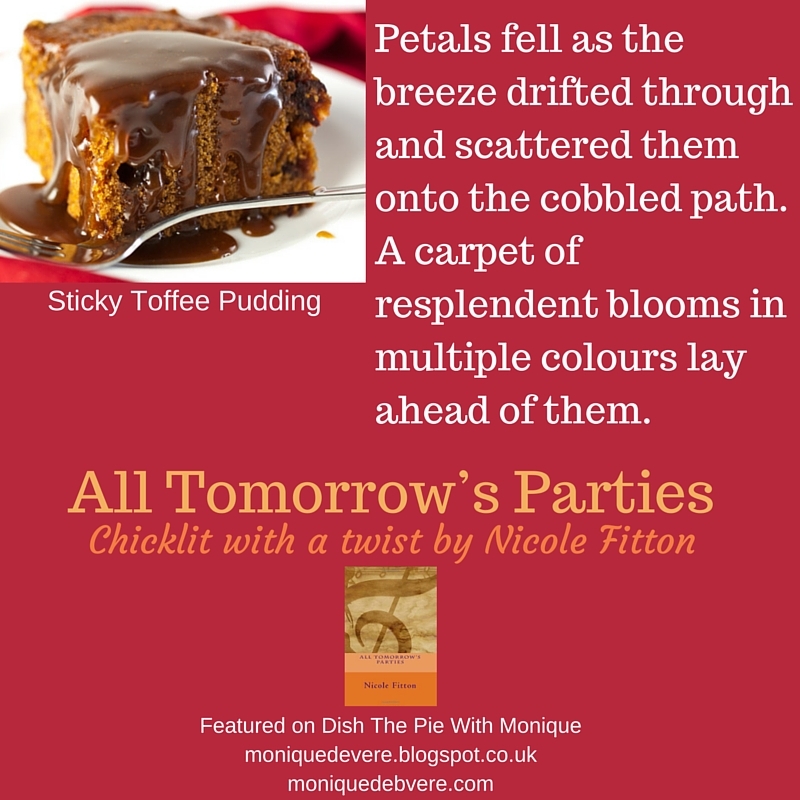 Chicklit with a twist is how it has often been described and has received many a rave review. 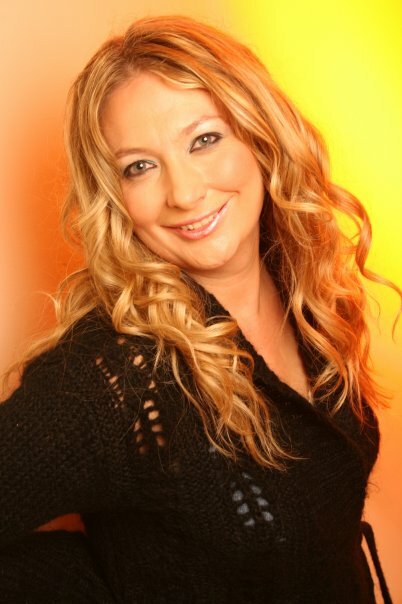 Her career to date has spanned 3 decades working in PR and marketing within Europe and the USA. She currently works within healthcare management in the UK. When not ‘doing the day job’ and apart from writing she enjoys field trialing her spaniel (who is very trialing! ), playing golf (badly) and drinking copious amounts of coffee. She likes all things shiny and really really likes fast cars. She is a member of the group Authors Helping Authors. 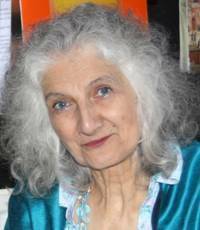 Her second novel is due for release in 2016.